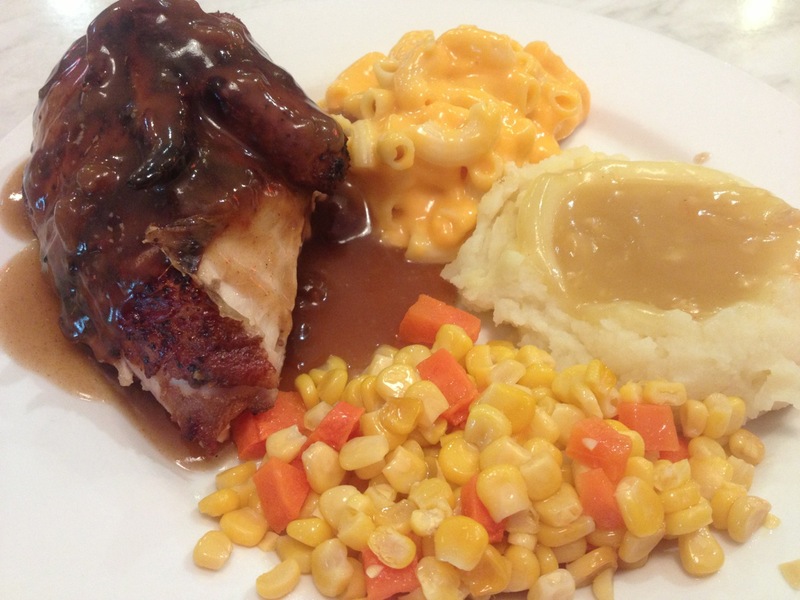 Kenny Rogers Roasters positions itself as a healthy alternative to fast food. It touts that the chicken is roasted over a fire for hours, a cooking technique that allows all of the fat to drip out of the chicken and leave you with a healthy meal. Based on what I experienced, it tastes like they take the chicken fat and use it to add chicken flavor to everything else on the menu. I wanted to get a true “Kenny Rogers” chicken experience, so I ordered a 1/4 chicken meal with two side dishes and a muffin. There were roughly 8 sides to choose from, but I went with traditional favorites: Mashed potatoes and gravy, Corn, and Mac & Cheese. Oddly, the muffin that comes with the meal came out five minutes before the rest of the food. I’m not sure if it was actually large enough to qualify as a muffin, but it’s been said that good things come in small packages. Unfortunately this was a case of a disappointing experience in a small package – although I swear that the size didn’t matter. 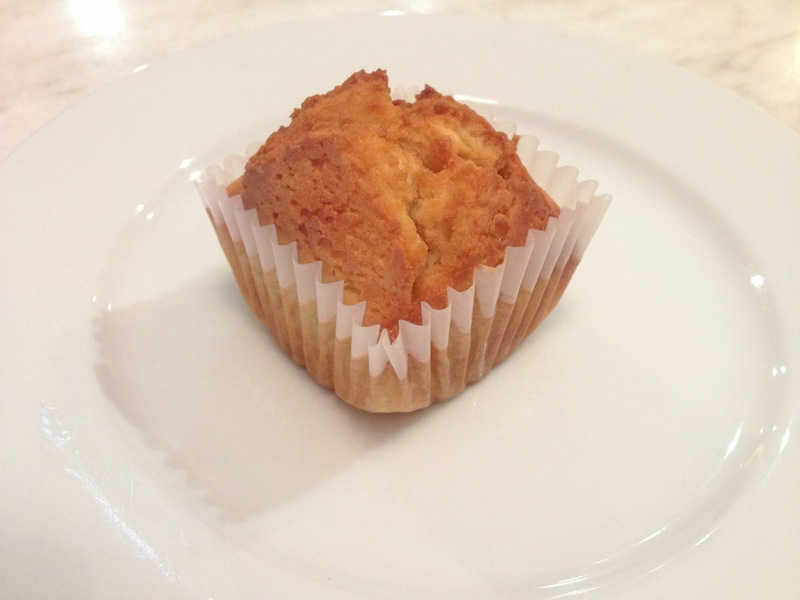 The muffin was warm and had a crusty top – which may actually be the most positive thing I can say about it. I actually feel the need to congratulate the food scientists at Kenny Rogers Roasters, as I am absolutely certain that they managed to fit an entire stick of butter into such a small package. The center of the muffin was actually so moist that I wasn’t sure if it was uncooked, or if I was experiencing a new take on the Boston Creme Donut with butter instead of vanilla cream in the center. A few minutes later the rest of my meal came out. Everything looked okay, although there were two things that immediately caught my eye upon further inspection. First, the Mac & Cheese had what I can only describe as an excessive amount of orange coloring in its ‘cheese.’ Second, the gravy that came with the potatoes looked to have the consistency of gelatin. Regardless of these initial impressions, I proceded with my meal. The mashed potatoes tasted of chicken. I’m not sure how this is possible other than from reusing the fat that dripped away from the chicken as it was cooking. These were clearly not real potatoes. The gravy was no better, but did explain where the chicken taste came from. I’m fairly certain that the gravy is two-parts chicken fat and one-part water – it explains both the consistency and taste. I moved on to the macaroni and cheese. The noodles were undercooked and tough. The cheese topping was not the flavor of real cheese, although I couldn’t quite figure out what it tasted like. Worse still, this excuse for Mac & Cheese had apparently been sitting in a tray for most of the morning, as the bottom layer of my side was cold – most likely from being the ‘top’ part of the tray that had been exposed to the open air for God knows how long. As for the chicken – the main course of this lunch – I ordered it with the original BBQ sauce. There were three other choices of sauce, but to get the real experience I decided that original was the way to go. The sauce tasted of chicken and burnt pepper. Again I’m reminded of what they do with the chicken fat. Taylor Swift comes on the radio now to remind me that she “knew I was trouble when I walked in” – a set of feelings that I too had when I walked into this establishment. I started into the chicken; it was difficult to get through the overpowering flavor of artificial chicken from the sauce that was ruining the actual chicken taste of the chicken. I tried going back to the mashed potatoes to force down some of the flavors in my mouth. At this point the potatoes had gone cold and the gravy had turned back into Jello – perhaps its native state. I gave the Mac & Cheese a second try and found myself struggling to get down the artificial cheese taste that was suffocating the undercooked elbows. Shortly after I finished the stick of butter masquerading as a miniature muffin. At this point I’m sick of everything on my plate and start thinking about the fact that at $7, this is one of the most expensive lunches I’ve had in 3.5 months of travel. It’s also the worst lunch I’ve had in 3.5 months of travel – even worse than the lunches I occasionally skipped for one reason or another. After eating this mockery of lunch I feel ashamed on many levels. I’m ashamed for the chicken that had to die to compliment the medley of terrible side-dishes while simultaneously being drowned in barbecue sauce engineered primarily of its own fat. I’m ashamed that I paid $7 for this lunch when I could have had twice the amount food for half the cost at a series of food stalls in ‘China Town’ next door. 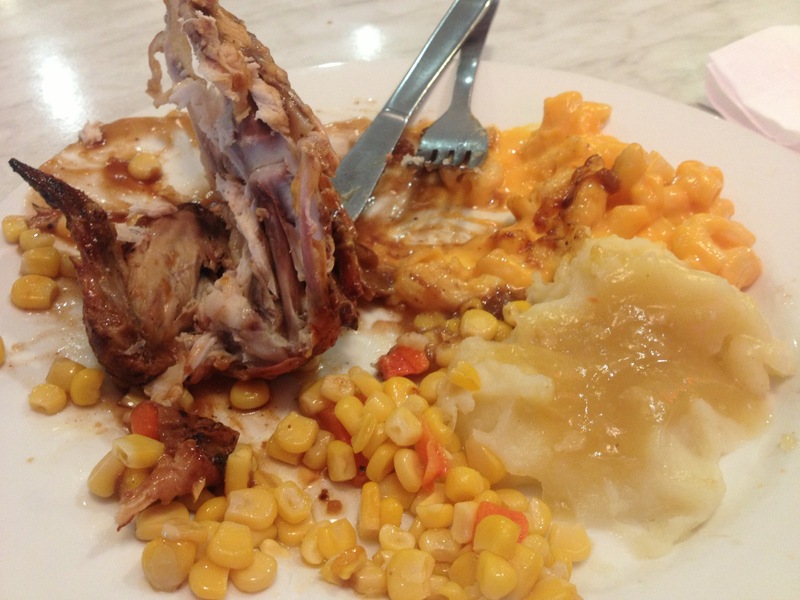 Overall, I can summarize my experience with Kenny Rogers Roasters with Kenny’s most famous lyrics. The emphasis has been added by me. Lastly, this was the closest thing to the infamous red neon sign that exists around here. This entry was posted in Malaysia and tagged Food Review, Kenny Rogers, Kenny Rogers Roasters, KFC, Starbucks, Terrible Meals. Bookmark the permalink. Too funny…….. Remember Grandpa Cherry Face and Lee’s Famous Recipie. He couldn’t get enough of it…….